Make no mistake. Yemen is Obama’s war, planned, orchestrated and initiated in Washington, using Riyadh and other rogue regional states to do his dirty work. On January 7, Britain’s Sky News headlined “Exclusive: UK Helping Saudi’s Yemen Campaign” – allied with Washington, complicit in high crimes against peace. 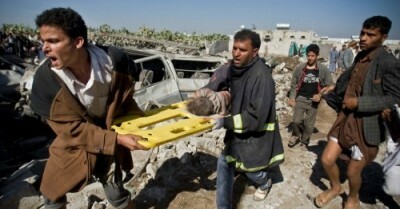 Yemenis are being mass slaughtered, civilians harmed most, indiscriminately targeted. Britain already supplies Riyadh with terror weapons. “Sky sources confirmed that six (UK) experts are working with Saudi targeteers who select locations for attack” – including residential areas, schools, hospitals, refugee camps, food storage areas, mosques and other nonmilitary sites. London’s Defense Ministry lied, claiming noninvolvement in warmaking – absurdly saying it’s “training the Saudis to comply with the international rules of war,” according to Sky News. Only fools and morons believe it. Amnesty International and Human Rights Watch have documented evidence of excessive Saudi war crimes. Washington and London are complicit in horrendous war crimes, genocidal ones, an entire population at risk, appalling human suffering persisting. Both countries maintain the pretense of wanting civilians protected – while conspiring to slaughter and starve them, along with denying them vital medical care. Britain has its own imperial aims. It supplies Riyadh with large amounts of terror weapons. It’s mindless of war crimes and other human rights abuses. We operate one of the most rigorous and transparent arms export control regimes in the world with each license application assessed on a case by case basis, taking account of all relevant information, to ensure compliance with our legal obligations. Truth is polar opposite these bald-faced lies – Britain complicit with US and Saudi high crimes against peace.